The House of Friendship during the 2013 Rotary Convention in Lisbon, Portugal, one of many Nusz has attended since 1997. In 1997, as an incoming club president, I was sent to Glasgow, Scotland, for my first International Convention. I have never stopped going since. Why? It was amazing to see people for the first time from all over the world, the different languages, dress, and food. But we all had the same dedication to Rotary. I ran into so many people I never knew before but today are still my friends, and I share Christmas cards with them, take part in club projects with them, join together for family activities, and so much more. Rotary conventions have helped me see the world: England, Australia, Singapore, Argentina, Canada, Portugal, Denmark. It’s not just about hearing the inspiring speakers at big sessions, but also experiencing the House of Friendship, and it truly is that. 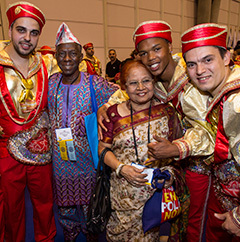 More than 75 Rotary Fellowships have booths where you can learn more about joining, and connecting with other Rotary members who share your interest. There are fellowships for music, quilting, yachting, chess, wine appreciation, stamp collecting, and more. I now belong to five and serve on the board for two. Plus I have sung in the World Choir for 17 years for the Convention Ecumenical Service. The convention is the biggest annual family reunion in the world. It is something that should be experienced at least once by every Rotarian, and something some of us wouldn’t miss any year. Come join the fun. This entry was posted in Convention and tagged #ricon15, testimonial by Rotary International. Bookmark the permalink. Attending Rotary Conventation is an amazing experience. I have attended at Bangok only and this was a life time experience.